This is a sight that is hard to miss during the holiday season for those who live in Monte Ingino, Italy. 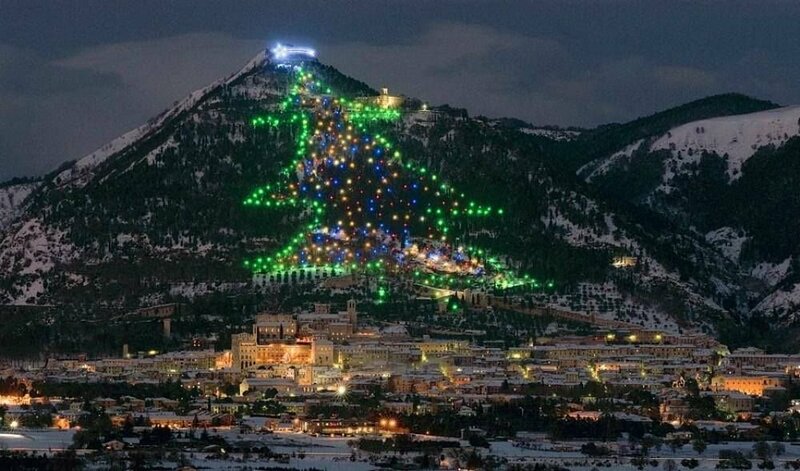 Lighting up the entire mountainside for all to see, this Christmas tree is one you won’t forget. 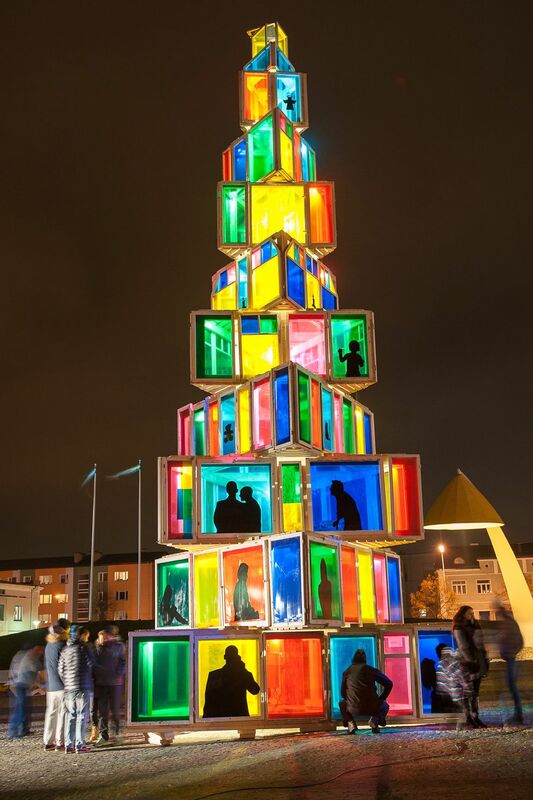 Like the previous Christmas tree, the people of Rakvere, Estonia celebrate the traditions of the holiday season in a beautiful and unconventional way with this colorful prismatic Christmas tree sculpture. 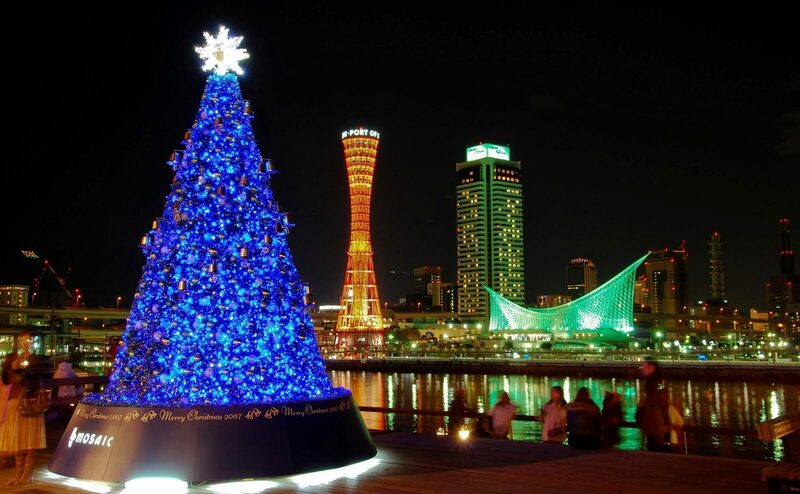 What could be more peaceful than a beautiful glowing blue Christmas tree by the waterfront? The people of Osaka, Japan celebrate the holiday season each year by filling Kobe Port with beautiful Christmas decorations that light up the night and can be seen all the way out at sea. The French give a lot of these Christmas trees on this list a run for their money with this colossal Christmas tree. 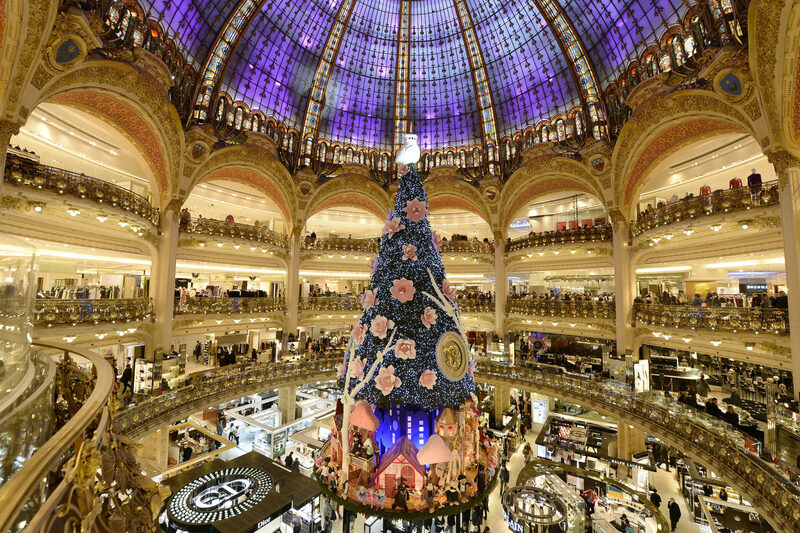 The tree stretches up 4 stories tall and acts as the main centerpiece under the beautiful stain-glass arched ceiling of the iconic Galeries Lafayette in Paris, France. The base of the tree is complete with a rotating stage with a whole cast of characters including Santa Claus himself. 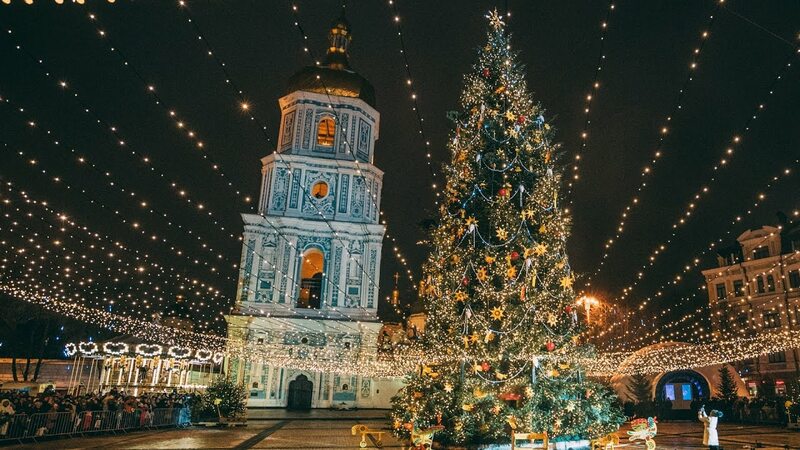 Christmas and New Year’s are two of the most beloved holidays of the Ukrainian people, so of course, their Christmas trees are a sight you have to see. Its tradition to celebrate these holidays outside with friends and family despite the cold. One of the largest outdoor celebrations takes place in Kiev, Ukraine under these bright lights and massive Christmas tree. 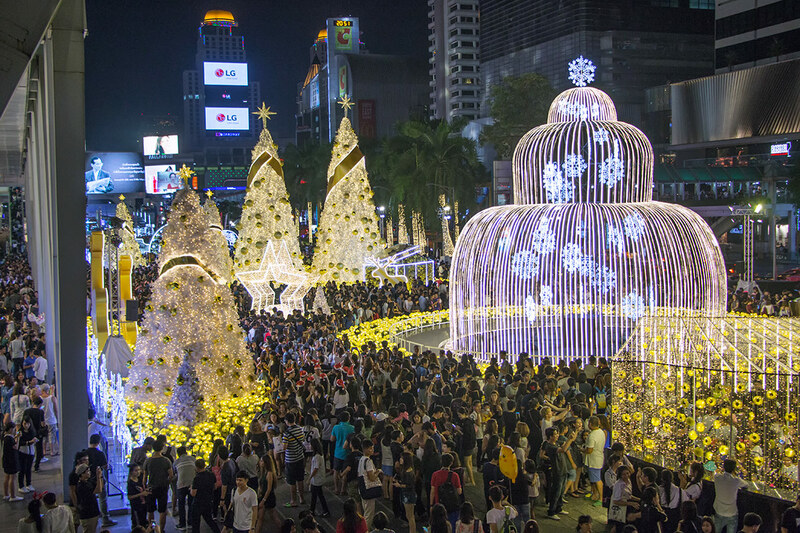 Christmas may not be a traditional holiday of Thailand but it is still recognized and celebrated throughout the country as a day of gift giving and thanks, especially in Bangkok, Thailand where city centers are decked out in bright strings of lights and every color, lighting up the night for shoppers and tourists. 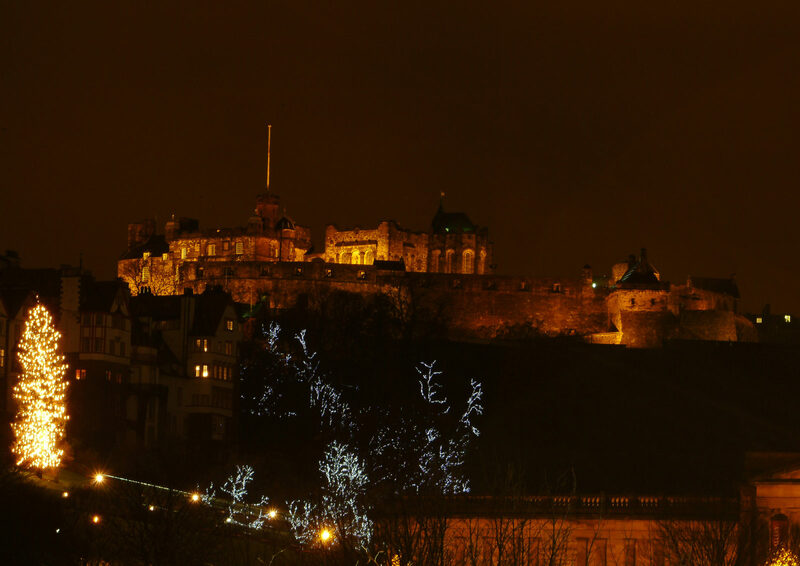 One of the best places to visit during the holiday season is Scotland’s beautiful capital city of Edinburgh. Christmas trees can be spotted standing tall next to medieval castles at every turn. The combination of the nostalgia of the holiday season and being surrounded by thousands of years of history is like nothing else. Edinburgh is also known for it’s bustling Christmas markets, ice skating rinks, and timeless beauty. As the capital of a predominantly Catholic country, Madrid, Spain really decks the halls when the holidays come around. The most recognized holiday sight in the city is the solid brass Christmas tree in the center of the capital’s square. 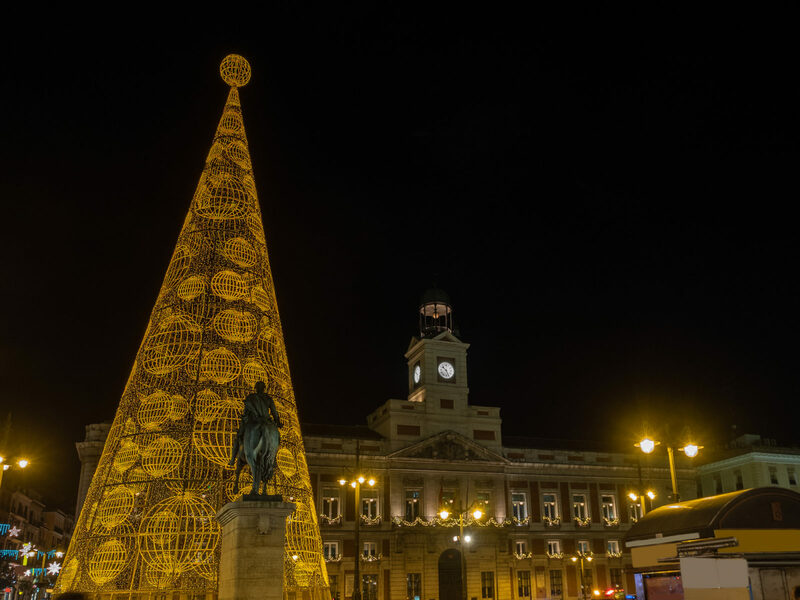 Christmas Eve is one of the biggest celebrations to take place in Madrid and there is lots to see from Three Kings Parade, Christmas markets, and varies tree lighting ceremonies. It might not snow in Laguna Beach, California but that doesn’t stop people from decorating palm trees in a gold coast winter wonderland. This might be the only Christmas celebration on this list where you can stand outside admiring the lights while in shorts and flipflops. The holidays are a time of peace and thanksgiving which is why the lighting of the Christmas Tree at the people’s house has been a White House tradition since the first Christmas at The White House. 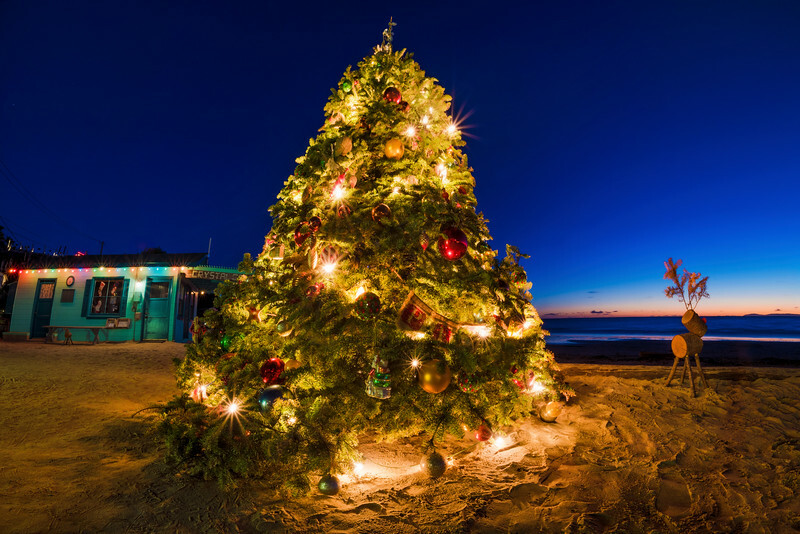 The Christmas tree is actually the property of The National Parks Service and it has been dubbed The National Christmas Tree. 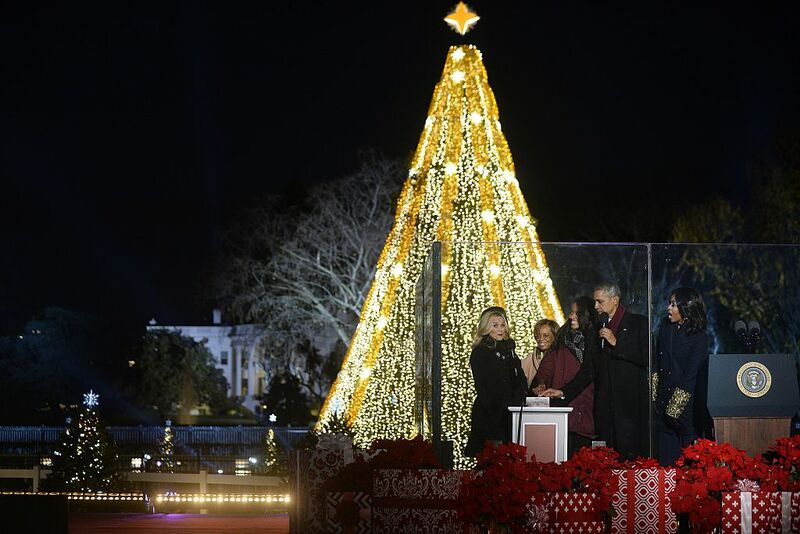 Every Christmas Eve at 5 pm the President and First Lady of The United States give a speech to the American people and light the tree welcoming in the holiday season. 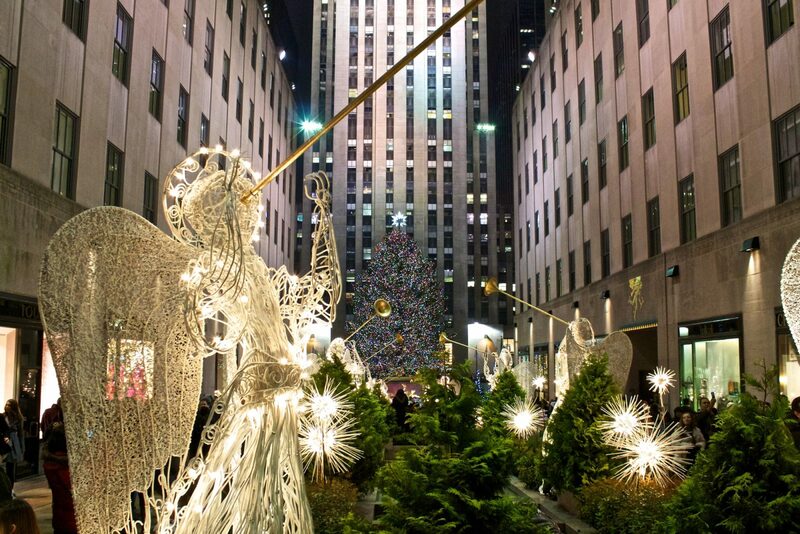 A just as iconic celebration for the American people is the traditional lighting of the Christmas Tree at New York City’s 30 Rockefeller Plaza. This Christmas tree sees a pretty early debut each year on November 30th as a worldwide symbol that the holiday season has arrived. 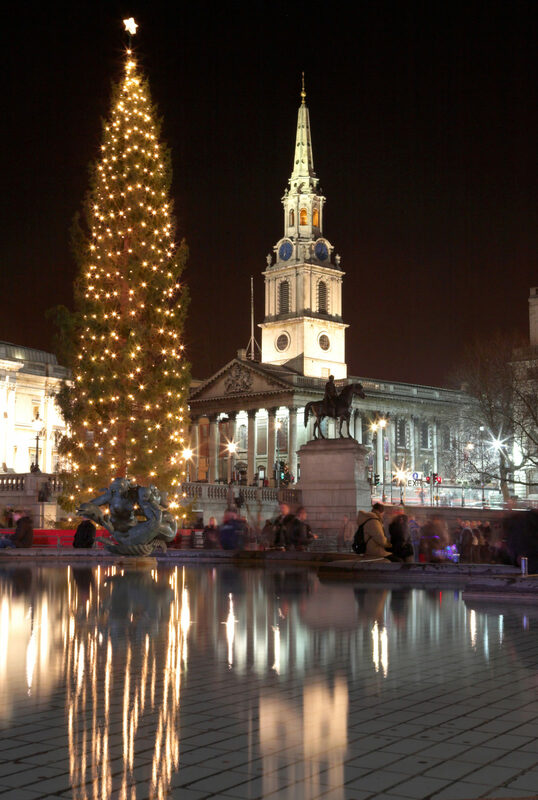 The Christmas tree itself in Trafalgar Square is actually a great symbol of the giving season. 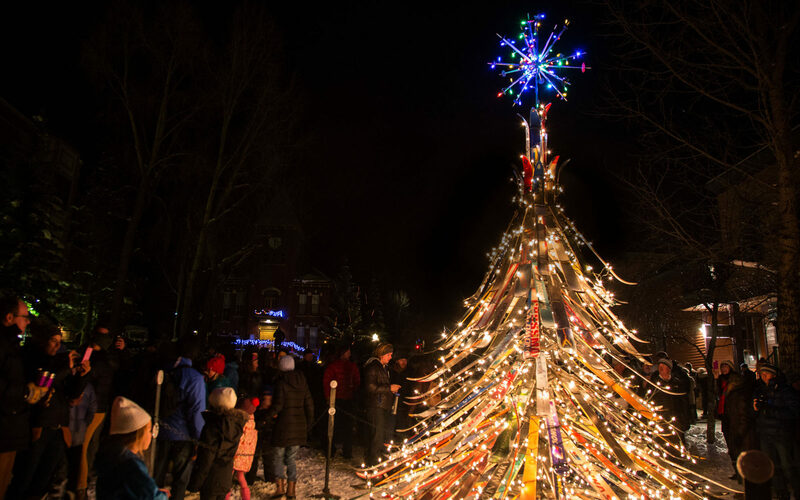 The tree is an annual gift from the Norwegians to the British and each year the Mayor of Oslo, Norway, the Mayor of Westminster, and the British ambassador to Norway, all come together for a very special tree lighting ceremony. This tradition began during WWII when German troops besieged Norway and in 1940 the neutral country was forced to surrender to the Nazis, the royal family, government officials, and many people from Norway were given refuge in London. Since then the Norwegian people remember the kindness and hospitality of the people of The United Kingdom even in the darkest of times, by lighting the Christmas Tree together. Saint Basil’s Cathedral is one of the most recognizable landmarks in the entire world with its signature colorful rooftop visible from almost anywhere in Moscow, Russia’s skyline. 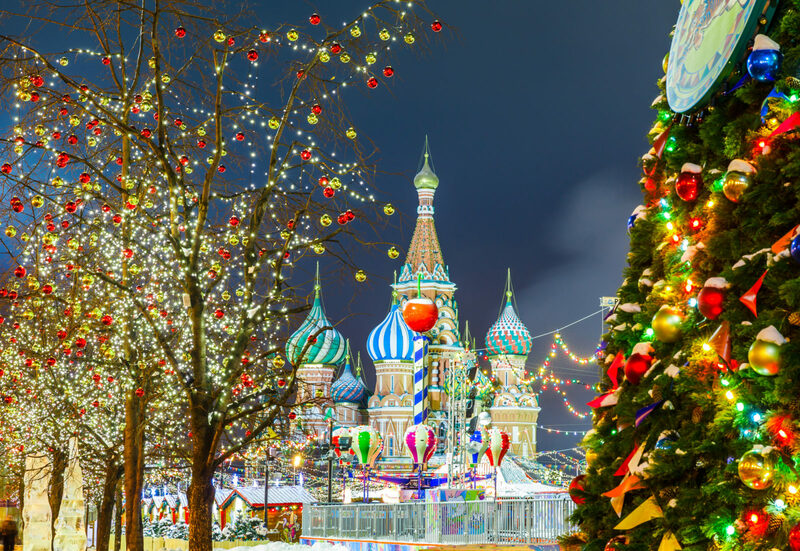 Christmas in Russia is celebrated on January 7th, as the Russian Orthodox Church celebrates its Christmas, in accordance with the old Julian calendar. The Christmas tree built in front ofSaint Basil’s Cathedral each year is always just as beautiful and colorful as it’s surroundings. Christmas is still widely celebrated across Taiwan even though it is not recognized as a state holiday. 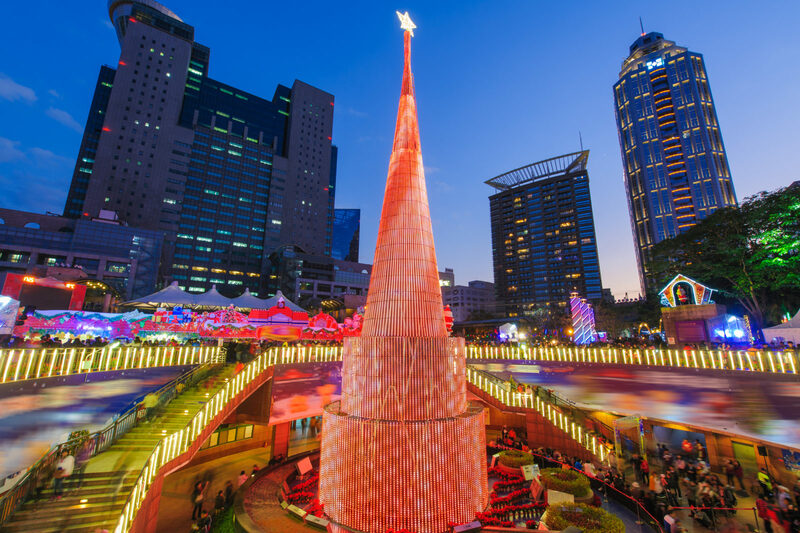 The city center of Taipei, Taiwan gets a winter wonderland make-over each holiday season with multiple Christmas night markets filled with famous Taiwanese street food eats and treats. 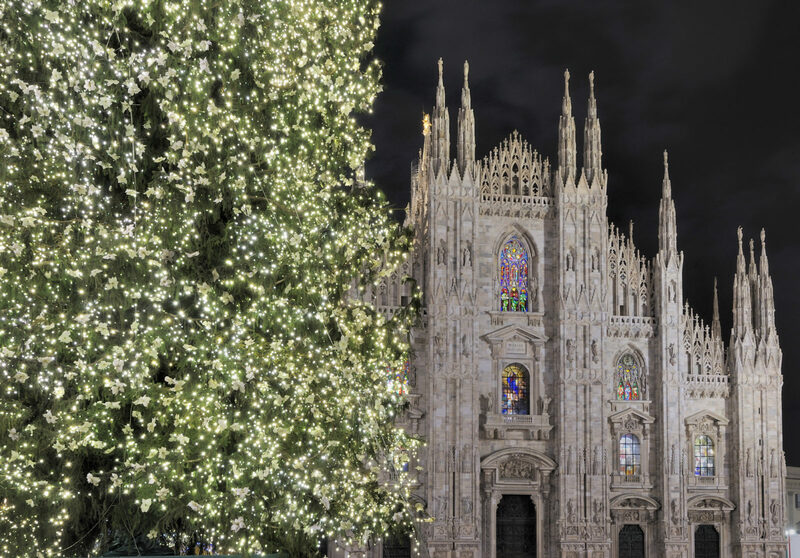 The elegance of Milan during the holiday season is understated and grand all at the same time. Beautiful century old cathedrals serve as a breathtaking backdrop to the sky-high Christmas trees that light up the night. The Christmas tree at The Piazza del Duomo is one of the most iconic sites during the Christmas season in all of Italy. There are few places as cozy and festive as a Christmas market in Stockholm, Sweden during the holiday season. 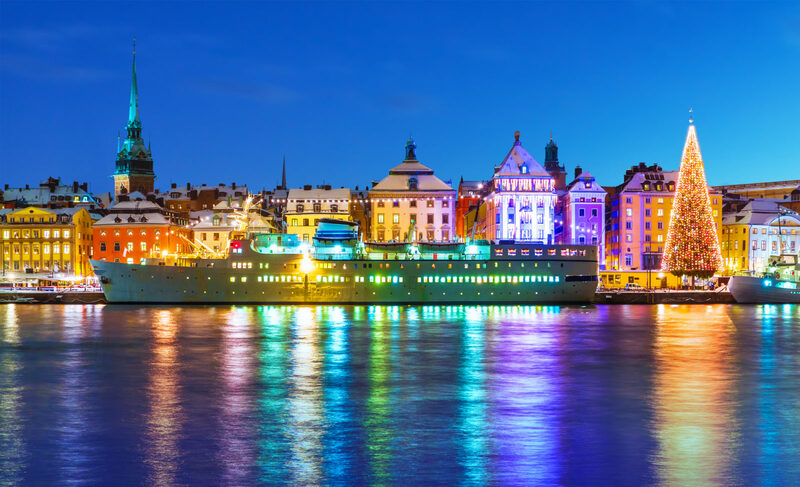 Christmas markets by the waterfront and a giant 5 story Christmas tree to light up the night as shoppers enjoy glögg and gingerbread are all traditional Scandinavian Christmas staples. From the colossal Christmas trees of Stockholm to the slopes in Colorado, there is never a bad place to celebrate the holiday season. The Telluride Ski Resort in Telluride, Colorado understands that it’s not where you are, but who you are with that really matters. During the holiday season, you can find many unique Christmas trees made out of old ski and snowboarding gear throughout the resort. Christmas in Brazil is definitely a special occasion and the city of Rio de Janeiro, goes all out boasting the record each year for the world’s largest floating Christmas Tree. 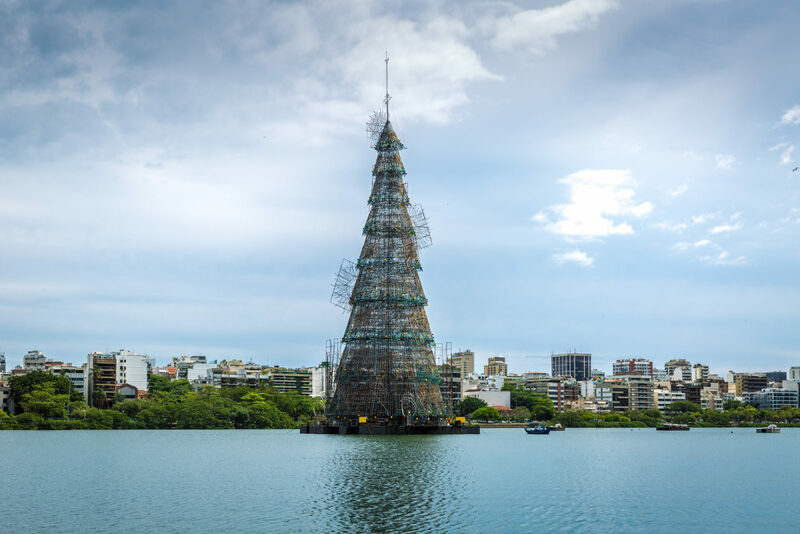 The Lagoa Christmas Tree has been a long time symbol of the holiday season for the people of Brazil. The Christmas lagoon is also known for putting on jaw-dropping firework shows every weekend of the holiday season for locals and tourists to come together and celebrate. Standing 125 feet tall in the heart of the city is the Cebu City Christmas Tree. Christmas in the Philippines is celebrated officially starting December 16th and ending on Christmas Day. It’s been said that Christmas music starts to be heard throughout the shopping centers and malls as early as September. 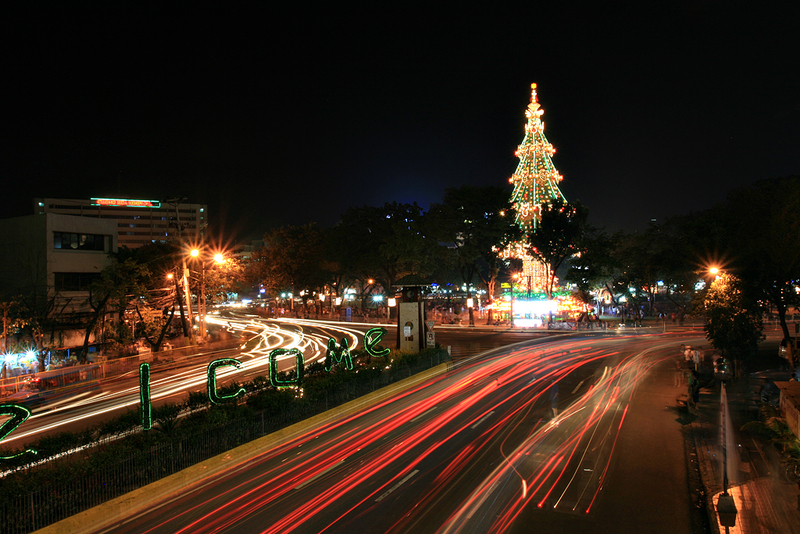 Christmas is celebrated as long as possible in the Philippines and the city of Cebu is known for its abundance of Christmas decorations and beautiful light displays throughout the city. 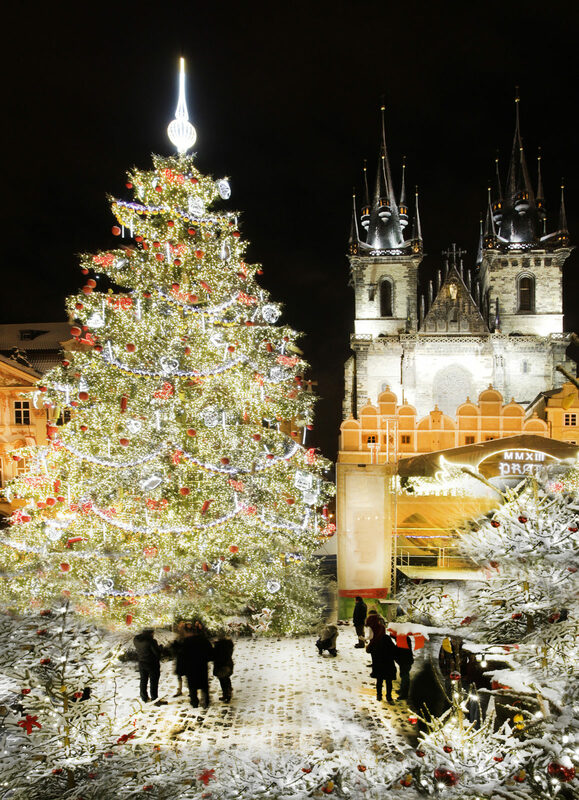 During the holiday season Prague’s Gothic architecture, cobblestone streets are transformed into a beautiful Christmas wonderland with Christmas Trees that fill up entire squares standing almost as tall as some of the churches. 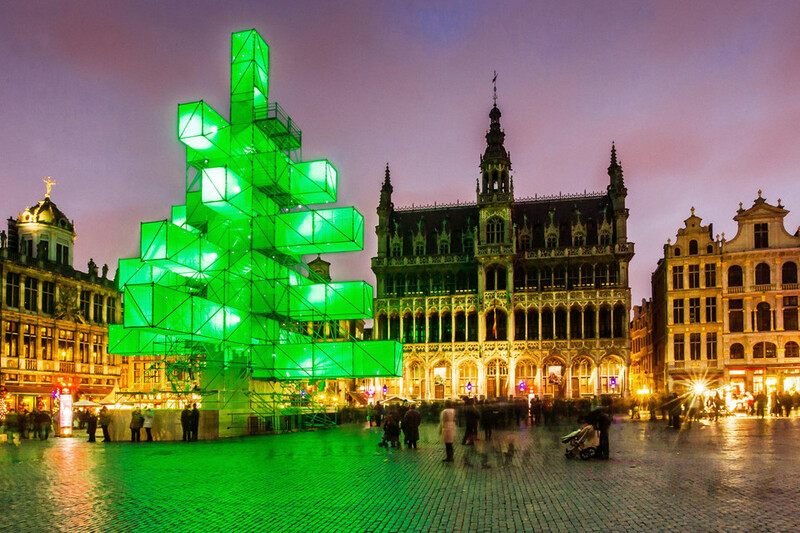 From November 24th to Christmas Day on December 25th, the entire city of Brussels is alive with bustling “Christmas Villages” made up of various Christmas markets, ice skating rinks, beer gardens, sculpture gardens, and massive Holiday themed art installations. Firework shows can be seen every night from Christmas Eve to New Years and the nights are always very lively with plenty of parades and live music. Many sculptures like the one above stand as Christmas Trees throughout the city centers. 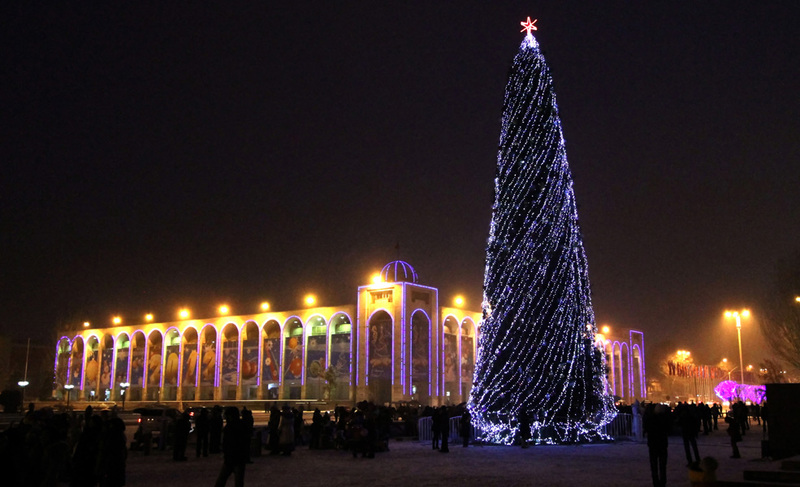 Christmas in Kyrgyzstan is celebrated as a day of rest and thanksgiving. Many Russian traditions make up the Christmas celebrations you see around Bishkek, Kyrgyzstan due to the heavy Russian influence on the country’s culture. Many attend outdoor Christmas tree lightings with friends and family and the real holiday festivities come out with a bang at New Years. 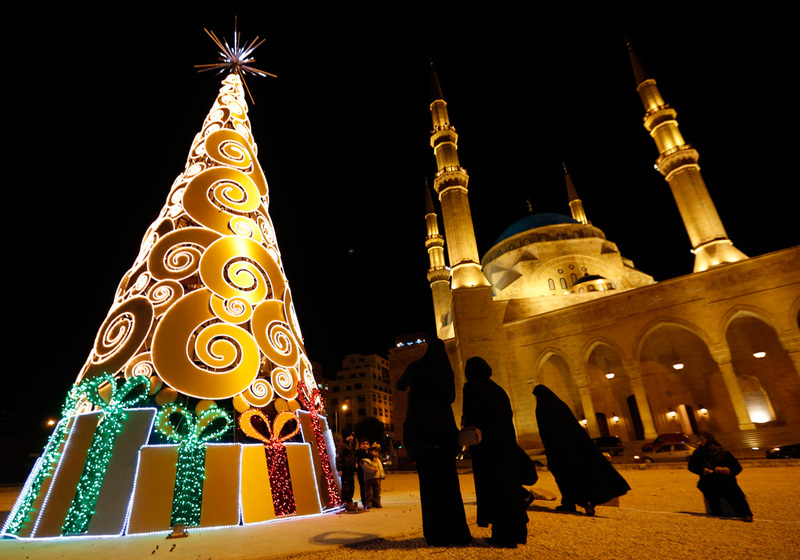 There is much to experience in Beirut, Lebanon during the holiday season. Unlike many locations on this list, most of the activities and traditions that take place during this time do not involve holiday shopping. In Beirut, there are many Christmas villages with elaborate light displays. Traditional activities include baking holiday spice cakes with friends and family, going to the cinema, and of course enjoying elaborate dinner spreads of lots of delicious handmade loaves of bread, fruits, nuts, and olives. Christmas in Portugal is all about the food and the festive light displays on those cool winter nights. 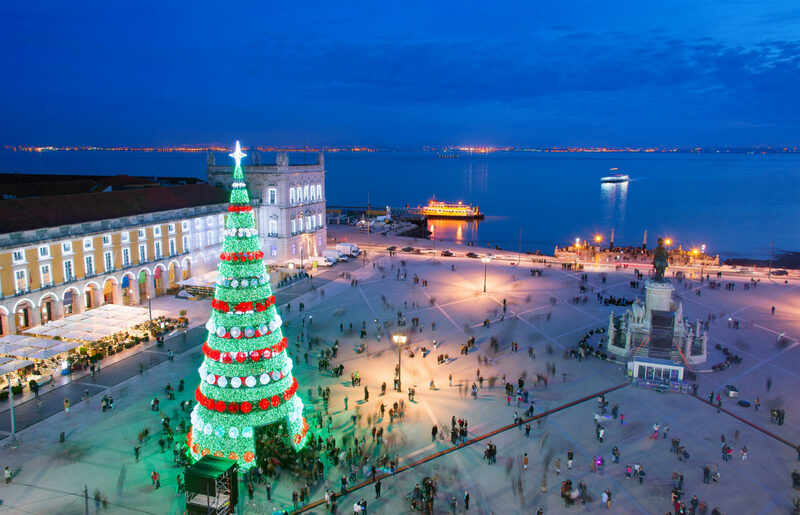 In Central Lisbon, Portugal one can expect to see the city lit up with Christmas trees of all kinds. From towering Christmas Tree sculptures filled with red patter lanterns to the traditional real-life trees, one can enjoy a plethora of Christmas tree splendor walking through any part of the city. The smell of bakeries overflowing with fresh ‘Bolo Rei’ or Christmas spice cake loaded with nuts and candied fruits makes for an unforgettable holiday season. 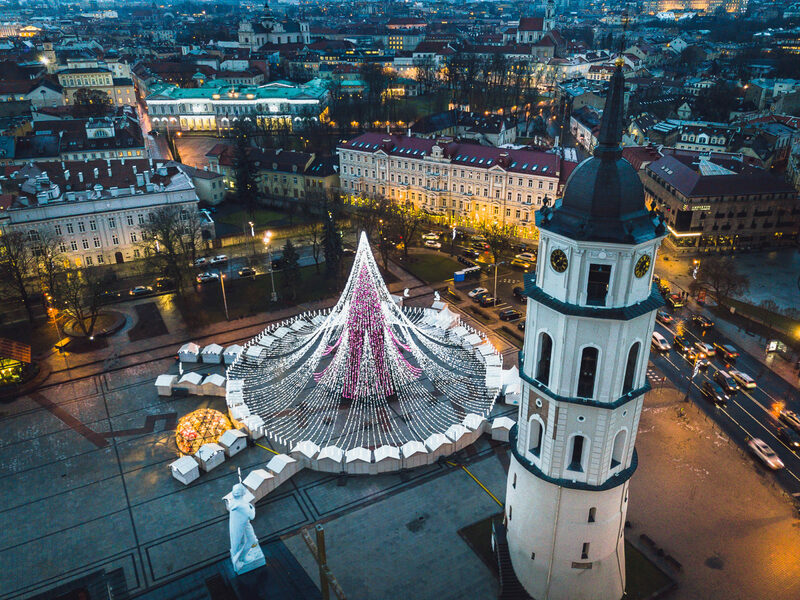 Christmas is one of the biggest celebrations in Vilnius, Lithuania each year with Christmas celebrations starting November 24th and going each day and night until New Years Day. Whimsical Christmas trees that look like they could be the homes of Santa’s elves themselves can be seen throughout the city center while people enjoy the bustling Christmas markets.